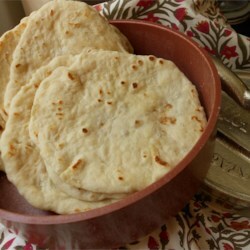 I've been trying to make tortillas since being taught by a Spanish family about 15 years ago - without a recipe. They always turned out like thick roadmaps. THESE DO NOT. What I learned from reading reviews and my Spanish family lessons: First of all, only use this recipe then...1. Shortening works as a great substitute, lard is best 2. Use your mixer with a dough hook if you have one. 3. Should be smooth as a baby's hiney when done kneading, no stretch/tear marks when you form a ball with the whole recipe. (Seriously. Pat the ball like you're giving a love pat. Should be the same.) 4. Do let the 24 balls rest under a damp cloth if you can. (10-20 min) They will not stretch back and become thick 5. Use light dusting of flour on your board and pin 6. VERY IMPORTANT: pick up and turn 90 degrees every time you roll to get a round tortilla! 6. Use a dry, extremely hot cast iron skillet. 7. Roll to dime width for large thin wraps, quarter for thin tortillas 8. Once cooked, stack wrapped in a damp towel or the 1st side cooked will stay crunchy. 9. Refrigerate leftovers or they will mold in a couple of days. 10. I like to make ahead and re-heat in foil in the oven @ 350@. HOPE THAT HELPS! Thank you LaDonna for the perfect ratio of ingredients that should be so simple but it's not and only the Grandma's know!